Spaniards may be gradually adopting safer habits, but they're not going easily. Helmets on motorbikes: yes. Banning cellphone use while driving: yes. Giving up cigarettes: not so much. 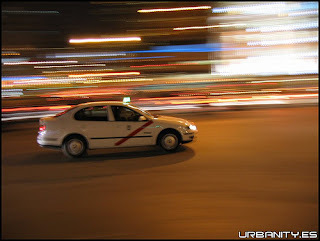 To wit: the strange behavior of cab drivers when it comes to seat belts. I have never seen a cab driver wear a seatbelt while he is driving in the city. Maybe they think it would impede their ability to gesticulate wildly while discussing the important topics of the day (how Zapatero is flushing the country down the toilet; what went wrong with the Barça this year; ham). Cabdrivers will, however, routinely buckle up as they pull out of the airport and onto the freeway. Probably there's a law requiring it. Sometimes they'll even check to make sure you've got yours on too. But then, as soon as they hit urban streets--that is, the very second they pull off the exit--off comes the seatbelt. As if they couldn't stand the crushing weight of restraint a moment longer. Because no one ever rammed into an oncoming car or rear-ended a parked vehicle on a city street.